Greenish Thumb: Free Book and Free Book Download - Bebop Garden!! 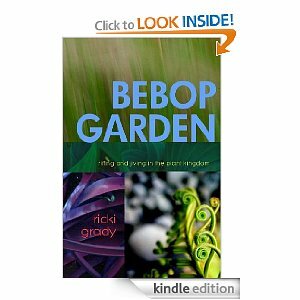 Free Book and Free Book Download - Bebop Garden!! Amazon is doing a promotion for BeBop Garden to run Tues Jan 24 & Wed Jan 25. During that time, anyone can download Ricki's book for $0 by just clicking here. Ricki (one of my favorite garden bloggers!) is hoping that this great deal will "kindle" interest far and wide. Of course, on Kindle, one would be missing the beautiful cover. Any person who leaves a comment on Ricki's blog including an email address will receive a downloadable version of the cover that they can then print out for themselves. GIVEAWAY: I've enjoyed reading about Ricki's passion for gardening and am so excited that she got to publish her thoughts in this funny and lovely little book. Leave a comment here and I'll put you in a drawing for my paperback copy (only read once by me - still with new-book smell). Drawing closes Sunday, 1/29. Then, be sure to go check out Ricki's blog and Bebop Garden! How exciting! Thanks for the info. I'm going to check it out. I LOVE my kindle. Hope all is well. Hi Wendy, are we from outside your continent be included in the draw, hahaha! Anyway, i will surely look at Ricki's book later. And thank you so much for letting us know. How neat! I am going to check it out right now! How nice of her! And of you, too! Love books with that new-book smell still! Thanks, Wendy, for the kind words and the extra promo! I love that bloggers are writing books! Awesome!